Eric Kripke speaks with Haley Taylor at the Toledo Museum of Art on Mar 16. Photo courtesy of TMoA. 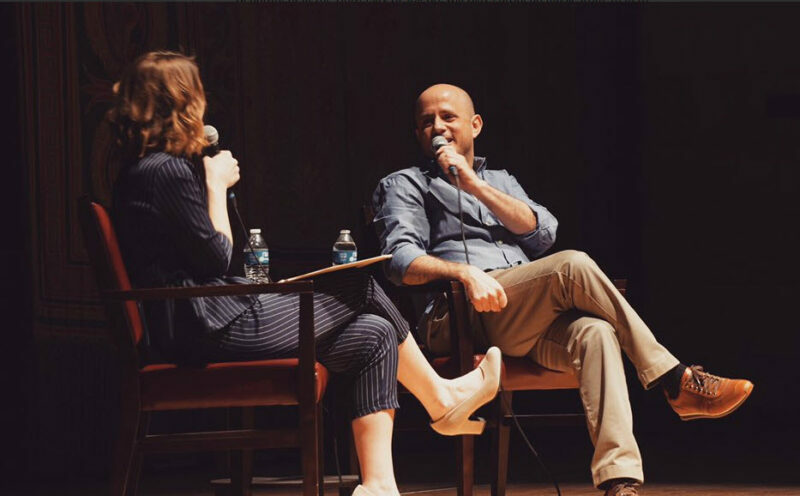 On March 16, the Toledo Museum of Art hosted “A Conversation with Eric Kripke” in the Peristyle, an auditorium built to call to mind the historical Roman marketplaces of history. Kripke sat down with public radio station WGTE producer and on-air host Haley Taylor to talk about his hometown, his failures and successes, and what the future holds. Kripke grew up in Toledo, and his years there in a city with rich urban legends colored his view of the creepy and occult and, as a result, the first few seasons of Supernatural. He put together a video montage of many of the Toledo references to the delight of locals in the audience. As a Cincinnati native, I didn’t immediately pick up on all the references, but the audience definitely did, like a clip from the Supernatural pilot episode where the “Woman in White” haunts her house on Breckenridge Lane, the same name as the street that Kripke grew up on. Sharing stories of home made the room feel small and the connection strong among the fans and the home town boy with a sharp sense of humor. Kripke shared that early on, he had wanted and attempted to be a comedy writer. The short films he wrote and produced, Truly Committed and Battle of the Sexes, won film festivals, and those winnings were subsequently put to work on the next project. He talked about being offered Tarzan in 2003 and how relieved he was when it was canceled. That cancellation gave him an opportunity to pitch something he’d been working on: a series called Supernatural, but the original pitch looked quite different from what we saw on the pilot in 2005. Originally, it was a story about a journalist reporting on hauntings, urban legends, etc. That pitch was turned down cold, so on the fly, he came up with the hunter brothers we know today, and the rest is history. 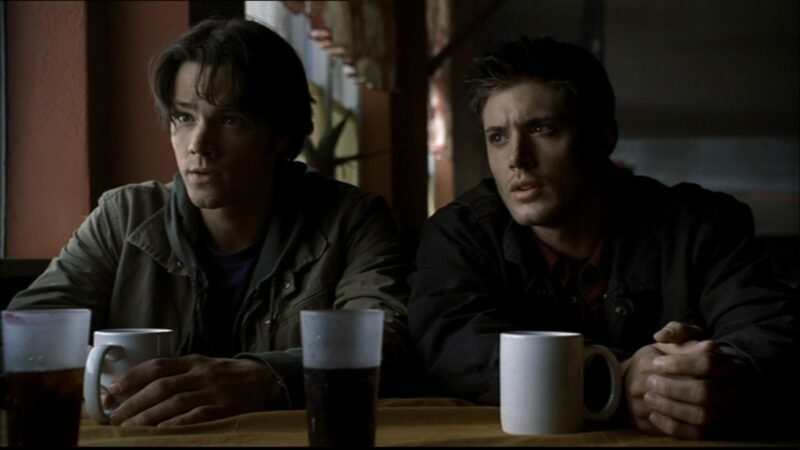 Jared Padalecki and Jensen Ackles in the Pilot episode of ‘Supernatural.’ Courtesy of Warner Bros.
After five seasons of Supernatural, Kripke was ready for a change, so he handed the reigns over to Sera Gamble and began work on Revolution and later Timeless, another series with a serious fan following. Timeless gave him a chance to build something with more diversity; it was a breath of fresh air after working so tirelessly on Revolution. 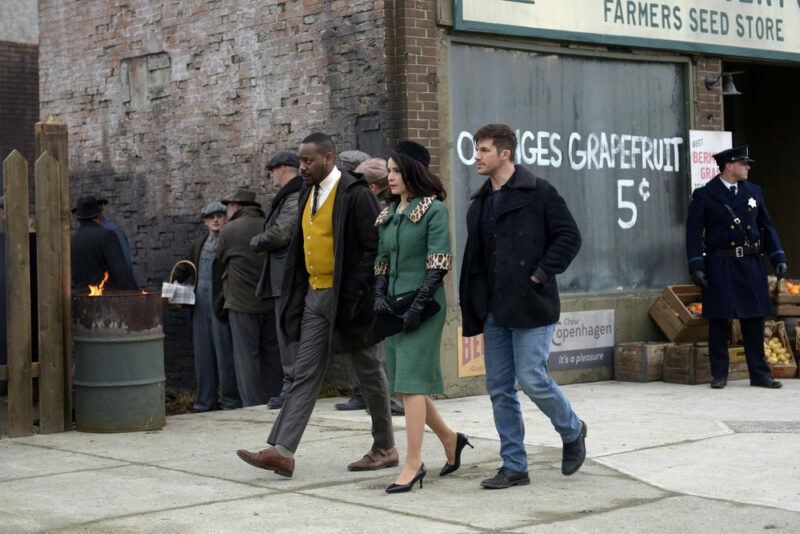 When Timeless was canceled after the first season, its fandom petitioned for its return, prompting NBC to reverse course and renew for a second season, only to cancel after season two. This was heartbreaking for the fandom, no doubt. Malcolm Barrett as Rufus Carlin, Abigail Spencer as Lucy Preston, Matt Lanter as Wyatt Logan in ‘Timeless.’ Courtesy of NBC. Kripke spent most of 2018 working on two projects: A House with a Clock in Its Walls, a screenplay based on the novel by the same name written by John Bellairs; and The Boys, a gritty new R-rated series to begin this summer on Amazon Prime. Kripke joked that it was difficult to remember which script he could swear in while he was writing a family movie and an adult drama at the same time. Attendees were treated to a preview of The Boys, a show about corrupt superheroes and the vigilantes who try to take them down. The show is dark and funny while being a twisted take on the superhero movies and shows we have been consuming for the last several years. And Kripke shared that it’s the closest to his sense of humor. It is based on a comic book series by Garth Ennis and was developed alongside Seth Rogen and Evan Goldberg. You can find a teaser trailer here. 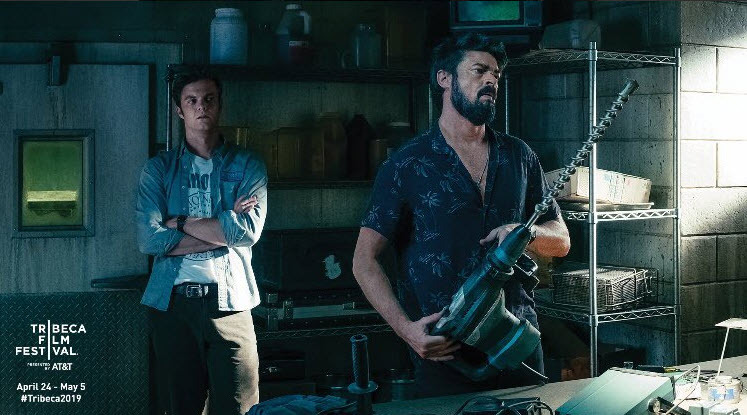 Karl Urban as Billy Butcher and Jack Quaid as Hughie in ‘The Boys.’ Photo Courtesy of ‘The Boys’ Official Twitter. Taylor called for questions from the audience near the end of the interview, and things quickly began to resemble a Supernatural convention, with fans filing along either side of the stage to take their turn. When Kripke was asked about how much he knew about the charities that Supernatural has spawned, he shared how proud he was of the work that Jared, Jensen, and Misha were doing and how the fandom has stepped up. There were questions about writing and how he kept going after rejections. He likened it to having grit and shared that you have to learn to take it and to keep going. He said, “Show me a confident writer and I’ll show you a bad writer,” which summed up this sentiment perfectly. Kripke spent time with fans after the event, taking pictures and signing autographs. He was down to earth, funny, and genuine, much like some of the characters we credit him for bringing to our screens. Supernatural airs on Thursdays at 8 p.m. EST on The CW. Timeless is available for streaming on Hulu. A House with the Clock In Its Walls is available for purchase on Amazon. And The Boys will begin airing this July on Amazon Prime. Stay with Nerds and Beyond for updates on Kripke’s upcoming projects! Previous story New ‘Toy Story 4’ Trailer + Poster Released!